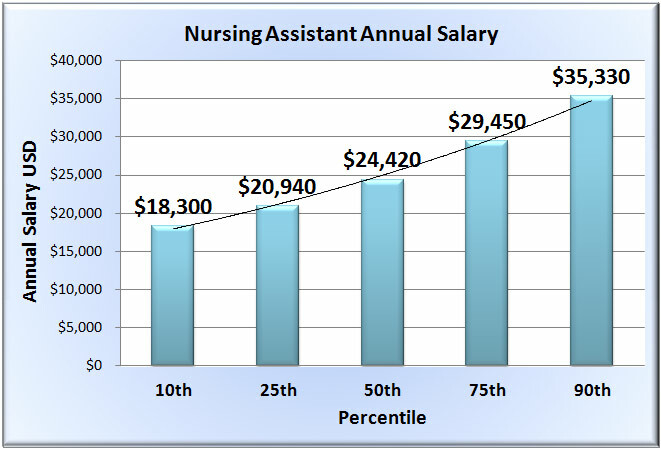 The average nursing assistant salary is $25,620 per annum, or $12.32 per hour. Nursing assistant salaries range from $18,300, for the bottom 10 percent of earners, to $35,330 for the top 10 percent of earners. Nurse assistants employed by the federal and state governments, colleges, and universities are paid the highest salaries. City regions found with top paying nursing assistant jobs include San Francisco, CA ($39,240), Fairbanks, AK ($35,860), San Jose-Sunnyvale-Santa Clara, CA ($35,210) and Naussau-Suffolk, NY ($35,000). Depending on the employer, nursing assistants may be paid bonuses which can amount to up to $200 a year. As of 2012, 1,420,020 nursing assistants were employed in the country. Many serve in nursing care facilities, hospitals, retirement communities as well as home health care facilities. Employment of nursing assistants is predicted to grow by 21 percent from 2012 to 2022. Nursing assistants will continue to be high in demand as the aging population of the nation increases and there is a growing need for long-term care services for the elderly.